It is a terrible feeling when you hit the button for your garage door opener and the door does not open or worse when the door goes off track. This situation is compounded when it happens and your car is stuck inside the garage and you should be at work or have an appointment. There are some very important components in the garage door system that are often overlooked, but can cause serious issues with your garage door. Serious issue doesn’t always mean spending lots of money. Spending a little extra for the repair to be done right can save you lots of money for expensive repairs later. Most homeowners understand that garage door springs break over time, so it is really not if the garage door spring breaks, but when and what else should we be looking at to improve the life and and function of the garage door. The first item we need to address are the end bearings plates. 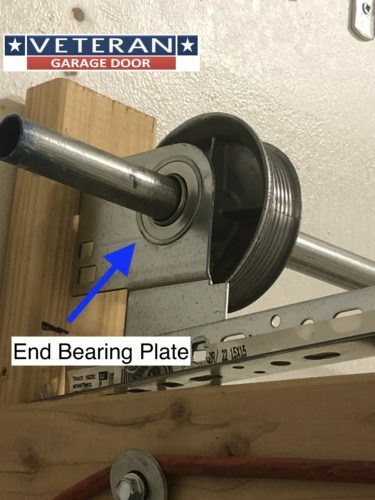 The end bearings plates are an important key in the function of the garage door. Manufacturers recommend replacing the end bearings when they have about 10,000-15,000 life cycles. In other words when the door has been opened and closed about 10,000-15,000 times. The end bearings are important because they are constantly supporting the the weight of the spring, spring bar and garage door. The bearings, over time, begin to grind and because of this grinding and additional friction cause the garage door opener to work harder. The end bearings plates are also a primary cause of doors going sideways or off track. This is caused when the end bearings bind up up and do not allow the door to open or close properly and the door goes off track/sideways. 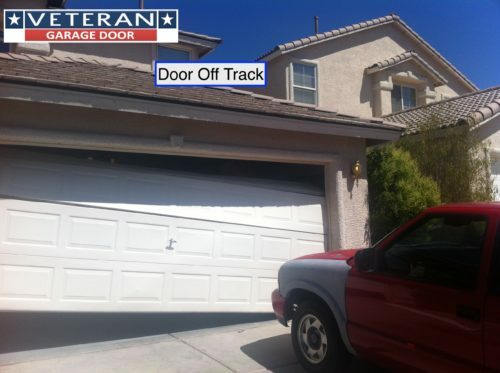 When a door goes off track/sideways, one or both cables come off the drum and the door will no longer open or close.When a door goes off track it can cause serious and expensive damage to the garage door and other parts in the garage door system. This, in many cases, can be avoided by replacing the end bearings plates when they begin showing signs of wear. When you visually look at the end bearings plates, you may think there is nothing wrong because they look fine and still turn, but if you look closer and touch the spring bar around the end bearings plates and see a black dust or powder, then it is time to replace them. This black dust or powder is metal shavings from the end bearings grinding on each other. Proper maintenance and lubrication will extend the life of the end bearings plates, but even with proper lubrication they will wear out over time. Replacing the end bearings plates when they show signs of wear is much cheaper than waiting for something bad to happen and damaging other parts as well. The next item, that is often overlooked, are the rollers. Garage door rollers come in multiple types from hard plastic or steel rollers with no ball bearings to sealed bearing designs. The cheaper plastic and steel rollers with no ball bearings have a very limited life cycle expectancy while the sealed z-bearing rollers offer a lifetime warranty. The rollers are important because, like the end bearings they are working to support the garage door as it travels up and down and support a great deal of the door weight when the garage door is open. 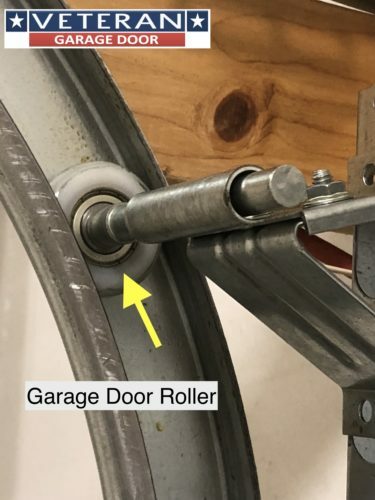 If the rollers are worn out they can cause the opener to work harder to open and close the garage door and can cause the door to go off track/sideways if they bind up. We offer 11 ball bearing rollers that are warrantied for 2 years, 13 ball bearing rollers that are warrantied for 5 years and the Z-Bearing rollers warrantied for lifetime. Rollers are an inexpensive and quickly changed item that can improve and lengthen the life of the garage door and opener. Rollers, much like end bearings, should be changed out when they begin to show signs of wear. Regular maintenance and replacement are much cheaper than waiting until they fail causing damage to the garage door or other components in the garage door system. Yearly Garage Door maintenance and regular lubrication will prolong the life of your garage door and opener and help you to identify worn end bearings and rollers. Simple and inexpensive maintenance and replacement of these critical, but often overlooked parts will keep your garage door functioning smoothly and help prevent the need for costly repairs and replacement later.